Quinto Sol has a story to tell. It’s part historical drama, part family lore, and it’s best told through food. Quinto Sol is Redwood City’s passport to the heart of Puebla, a state in central Mexico. Celebrating cocina barroca poblana, the culinary traditions of Puebla, Quinto Sol’s fare is different from what many in Redwood City would consider familiar. The Mexican food that is most common in our town is from the state of Michoacan. But the food of Puebla, considered Mexico’s culinary epicenter, is marked by a polygamous marriage of flavors that only political and historical strife can bring. The sauces of Quinto Sol. Clockwise: Chipotle, , , Salsa Verde, Guajillo, Mole (center). Moving through the menu at Quinto Sol is to navigate culinary and political history. With its vicinity to the port Veracruz, Puebla was privy to an influx of ingredients tucked under the arms of foreign traders and invaders alike. Enjoy the Lomo de Cerdo, a chorizo stuffed pork tenderloin, and taste the Spanish conquistadors arriving in the 16th century. The French invasion and historic defeat in the 19th century is most often celebrated with parades and parties on Cinco de Mayo. But from a culinary perspective, the lasting impact is in the sauces. Rich, decadent cream sauces churned from indigenous herbs, spice and peppers, are living history of the French and Poblana cultures colliding. When the Chinese arrived in Mexico ready to build railroads, their course was set through Puebla. The railroads were built, and noodles and chicken consommé were introduced to the Poblana palate. This gives context to the sautéed vermicelli noodles in Fideos Secos al Sol, making it not the odd man out amongst burritos and enchiladas, but a reflection of history. The same goes for the Caldo de Pollo, a chicken soup that tastes as if your own grandmother was in the kitchen. 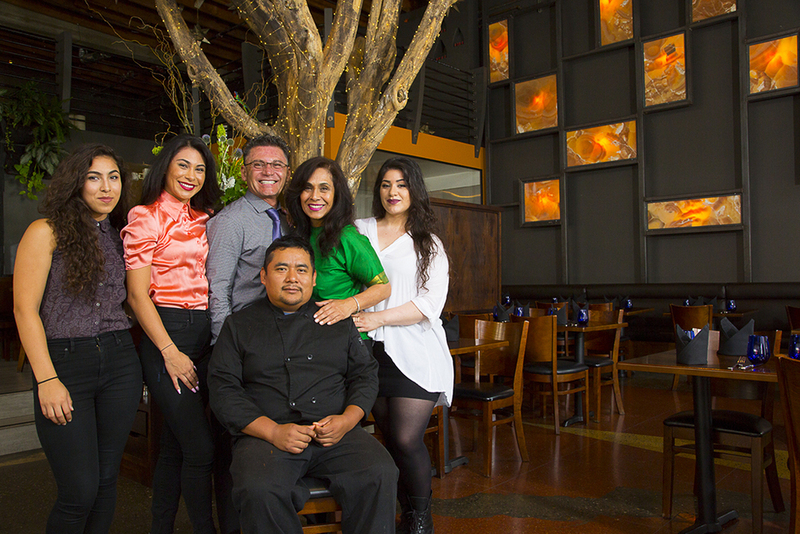 While each of Quinto Sol’s dishes is a plated history lesson, they are also a window into the Sol family. Comprised of Hector, Helena, and their daughters Alexa, Paulina, and Camilla, the Sols have crafted a menu based off of their family recipes. “I was very close to my grandmother, and would cling to her side as she cooked,” Helena shares with a nostalgic smile. “I can still smell the aromas of her cooking, the feeling of rocking back and forth with her as she would grind cacao beans onto a stone board.” That same grandmother lives on at Quinto Sol. The guajillo sauce, a slow-cooked sour cream reduction made of peppers, garlic and cinnamon, is created using her original recipe. A signature sauce for the Sols, it has been awarded the honor of “the essence of our family,” by Paulina. Rich and decadent, it is unlike any flavor one will find elsewhere, and should not to be missed. Though the history of Puebla and the traditions of the Sol family lay the foundation for Quinto Sol, there is one motto that reigns supreme. “My dad always says, whatever you do, make it flavorful,” explains Paulina. This emphasis on flavor holds steady throughout the entire menu, with each dish a true standout in its own right. Lighter dishes such as the fresh fish Ceviche or the cacti Nopales salad, are packed with as much flavor as heartier, sauce-ier dishes, such as the Rajas Poblanas. This emphasis on flavor is what makes it possible to have an indulgent meal at Quinto Sol without feeling overburdened by gluttony. Espiritu de Oaxaca in all of its smoky, mezcal glory. The attention to flavor detail is similarly reflected in Quinto Sol’s cocktail menu and decor. The Espiritu de Oaxaca, a cocktail crafted by Alexa, capitalizes on the smoky flavors of the liquor, mezcal. The tequilas served were purposefully selected by Hector and Helena, and the margaritas are made following a perfected recipe. Look up to see the stars created by a Pueblan artist that Helena discovered, or to the bar to see what she calls “the tree of life”, a piece from an artist in her mother’s hometown. The collective result is an ambiance that is both vibrant yet sophisticated. No detail of the Quinto Sol experience was left to chance. Indeed, Quinto Sol expands Redwood City’s definition of Mexican food. It brings to light the culture and history of a family and state. Through Quinto Sol, one travels to Puebla, Spain, France, even China. But what is felts is the Sols - their traditions and passion for flavor and hospitality. The Sols are stewards of Puebla’s history, of cocina barroca poblana, and are keeping it alive in the heart of Redwood City. Thanks to Climate Magazine (www.climaterwc.com) for sending me to Quinto Sol on assignment. This article and photos were featured in the July issue. For other Redwood City culinary adventures, check out the magazine online at climaterwc.com or pick up a hard copy at your favorite Redwood City store/shop/cafe!